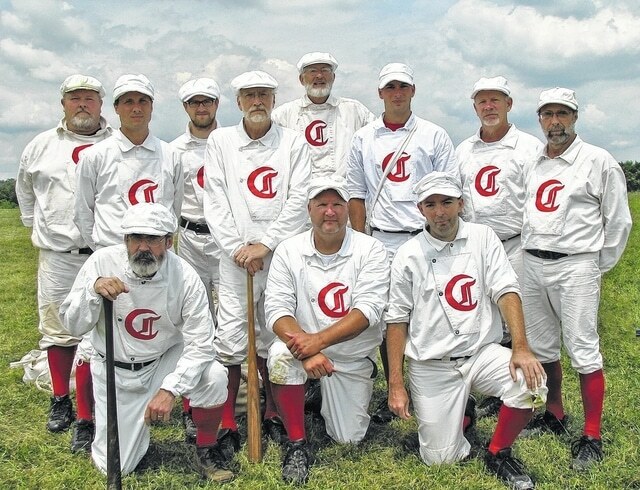 Pictured are the “1869 Cincinnati Red Stockings” vintage baseball team. REEDSVILLE — The Cincinnati Red Stockings, a vintage baseball team, will be showcasing an old-fashioned brand of baseball at 1 p.m. Saturday during the Meigs Heritage Festival at Eastern Local High School in Reedsville. Admission for Saturday’s game is 25 cents, the amount charged to attend a game in 1869. According to the latest inflation data, the value of 25 cents in 1869 is equivalent to roughly $5 in 2015. The team travels to locations in the Cincinnati area and around the Midwest to share the experience of vintage baseball. The team’s home field is located at Heritage Village in Sharon Woods Park, Sharonville. The village is a recreated 1800s community featuring historic buildings that have been moved to their present location. It is in this setting that the game is played as faithfully as possible to 1869 rules and customs that include bare-handed fielding and uniforms and equipment made as accurately as possible to the standards of the era. There are no leagues or champions; the game is played by gentlemen with a true respect and appreciation for the game and its participants. Vintage baseball is played with rules used during the Civil War. This makes Heritage Village one of the very few places in the world where you can see baseball as it was by played by the Cincinnati Red Stockings in 1869. The Red Stockings symbolize and recreate an important time in baseball history. When most people think of the Wright Brothers, the names Wilber and Orville, pioneers in aviation, usually come to mind. But another famous pair of brothers named Wright deserve recognition for their contribution to baseball. In 1869, the Cincinnati Base Ball Club, with Harry Wright as captain, became the first all-professional baseball team in the nation. His younger brother, George, a short-stop, was considered the best player of his time, and both are in the Baseball Hall of Fame in Cooperstown, New York. The Wright brothers traveled with the Cincinnati Base Ball Club coast to coast. Dressed in knickerbockers with crimson hosiery, the team won all 57 games they played that year. They became known as the Cincinnati Red Stockings and their style of play introduced America to the new game of baseball. Due to their success, Cincinnati became known for having the first baseball team in the nation. Ohio could now claim two sets of famous Wright brothers.